An airport layover doesn’t have to mean that you’re stuck in the airport. In this series, local experts in the world’s most popular hub cities recommend sightseeing itineraries for every time frame—even if you don’t have time to leave the building. This week, we spoke to the city experts at Context Travel—because they’ve sussed out the best walks in the world’s cultural capitals—to get tips for a rewarding and reinvigorating layover at Amsterdam’s Schiphol Airport. How to get out of the airport: Amsterdam’s Schiphol Airport is a short train hop from the city center, and it’s well worth popping into town if you have an airport layover of more than four hours. Trains depart every five to ten minutes; allow 30 minutes to comfortably get from the airport to the city center, and remember you’ll need to be back at the airport about one and a half hours before your onward flight is due to depart. Train tickets cost €3.80 each way and can be purchased with cash or credit card at ticket machines in the station. What to do with your luggage: Travelers can store their luggage in lockers when they leave the airport. Find them in Departure Lounges 1, 2 and 3, the Departure Lounge at Pier D, Arrival Hall 3 and the Baggage Basement Square at level -1 between Arrival Halls 1 and 2. Prices depend on the size of the locker and start at six euros for 24 hours. The train from Schiphol brings you straight into Centraal Station, steps from the heart of Amsterdam. A four-hour layover will give you time to stroll about in the neighborhood around the train station and enjoy the unique atmosphere without overly challenging your flight-fried brain. As you exit the Station, head in a straight line along Damrak, the main thoroughfare. Beware of trams and cyclists coming at you from all directions and make sure you always look both ways when crossing the street. Pay particular attention to the cycle paths: They are clearly marked (light pink with white bicycles painted on the road) but often share sidewalk space, so remember to look down regularly. Cyclists rule the streets here, but things work when everyone keeps to their allotted section. After 10 to 15 minutes of strolling past numerous coffee shops (Amsterdam’s notorious marijuana outlets), restaurants, and hostels, you’ll arrive at Dam Square, home to the magnificent Royal Palace (Dam, Amsterdam; + 31 20 620 40 60; www.paleisamsterdam.nl) Built during the 17th century as the Town Hall at the height of the Dutch Golden Age, the grand building is today one of three palaces in the Netherlands at the disposal of the monarch. At Dam Square turn left and walk two blocks until you reach a canal. Turn left again without crossing the water, and you’ll find yourself in the heart of De Wallen, Amsterdam’s infamous red light district. It’s also one of the oldest areas of the city, and as you walk along the canal you’ll pass modern shops and cafes amid 14th-century architecture. If you have time, drop into the Oude Kerk (Old Church), on your left as you head back toward the station (Oudekerksplein 23; +31 20 625 82 84; www.oudekerk.nl/en/). The 800-year-old Oude Kerk is Amsterdam’s oldest building; it still functions as a church and also hosts secular events and contemporary art exhibitions. As the canal narrows, follow the road around to the left, emerge opposite Centraal Station, and hop onto the train back to the airport. The Van Gogh Museum and the Rijksmuseum are world-class art collections, but we really can’t recommend them for a layover. Between flights you need fresh air and exercise, not standing in lines and battling hordes of tourists, then feeling too rushed to fully absorb the works of the Great Masters anyway. 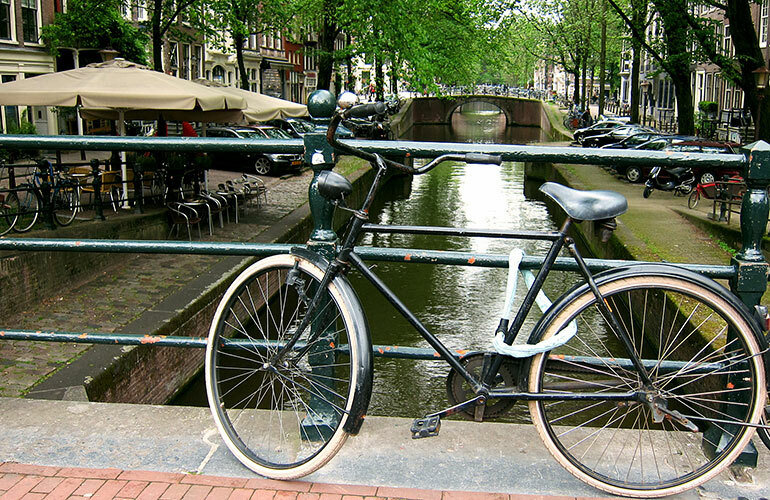 Instead consider an invigorating walk with a local expert, such as a journey through the grand canalhouses of the Jordaan to find out how trade, power, and art intersected during the 17th century to produce Amsterdam’s so-called Golden Age, or an exploration of Amsterdam’s reputation as a Model City. The meeting point for these tours is less than ten minutes from the train station, and each walk lasts three hours. You’ll get a solid introduction to the city and learn a lot more than you would on your own, given your jet-lagged brain. If your layover is less than four hours long, or you’re simply too exhausted to embark on a whirlwind tour of Amsterdam, you could do a lot worse than chilling at Schiphol, which is a city in itself. You can experience a wealth of Dutch culture, from cheese to tulips, and even a slice of the Rijksmuseum, which has an outpost at the airport. There’s also a spa, massage options, a casino, a Silence Centre meditation room for all religions, and—best of all—a huge public library with a focus on Dutch culture. The library holds translated fiction in 30 languages, plus local photo books, videos and music. If you’d rather read your emails or Facebook feed, the whole airport offers free Wi-Fi. I haven’t had a layover, in the past 6 yrs but at that time they had tours from the airport. They did a tour of the city, out to the countryside to see the windmills and ending with a boat ride. It was about $40 euros. With limited time, it was a great way to see the city.